Southerness Golf Club is aptly named because it’s the most southerly golf course in Scotland featured on our website. The course is set on the edge of a remote headland on the peaceful Solway coast and is virtually unknown by the golfing masses. The mountains of the Lake District are clearly visible on the opposite side of the Solway Firth and just across the water, about five miles away as the seagull flies, is the other excellent links course at Silloth on Solway. A lighthouse was built not far from here to guide shipping entering the River Nith and they have used the lighthouse as Southerness Golf Club’s emblem. 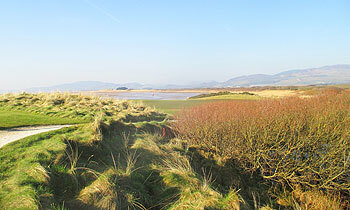 A panoramic view of Criffel peak (the highest of the local fells) is also on offer from this classic and natural links course, but Southerness is a relative juvenile in the scheme of things. The club was founded in 1947 and it’s one of Britain’s last genuine championship links developments since the 2nd World War. Philip Mackenzie Ross, a former partner of Tom Simpson, laid out the course and Southerness is considered to be Ross’s most respected composition. Ross went on to become the first president of the British Association of Golf Course Architects. On the surface of it, Southerness appears to be relatively short, measuring a little over 6,500 yards, but with a lowly par of 69, it’s one of the toughest golfing tests in the land. The standard scratch score of 73 suggests that par is extremely challenging. On occasions, no doubt, the competition scratch score is even higher. There are two short par fives which offer realistic birdie opportunities, but there are eight par fours measuring over 400 yards and this is where shots will be dropped. The fairways always seem to be generous and inviting, but there’s gorse and heather waiting to catch wayward shots. Let’s be honest – with so many 400-yard plus holes, you can’t afford to leave the driver in the car. Probably the best holes run along the shore, starting with the 8th, and the line to take is the lighthouse in the distance. The 12th and 13th are particularly strong holes. Dumfries might not feature as a golfing venue of first choice, but if you include Silloth on Solway and Powfoot alongside the mighty links here at Southerness, you will be hard pressed to find better golfing and you will certainly get outstanding value for money. Played on a sunny day with a 1 club wind (so feel fortunate!). Loved the tranquility of the golf course, with a quiet opening few holes with the mountainuous backdrop. There are some decent holes on the front but the true excellence is saved for the back. Agree with Jim M. that 11 to 14 are top quality. Everyone talks about 12, quite rightly, but 13 and 14 are better holes. Only the short par 5, 18th can be considered an "easy" hole, however having a reachable 5 as a finish is a routing philosophy I completely support. Overall, a really good, enjoyable golf course which is worth the drive. Except for the undeniable beauty of the 12th hole there’s nothing truly outstanding at Southerness. Please note that this isn’t meant with negative connotations though because everything about this true links course is of a consistently high standard and is undoubtedly one of Scotland’s sleeping gems. In terms of quality the course flatlines at a very high level throughout the round. There aren’t the extreme highs and lows that other venues of a similar rating might dish up. Some people will like this steadiness whilst others may prefer a course that delivers a few moments of magic at the expense of a few dud holes. I can think of few other courses that boast such a series of long and demanding par fours than here. Even from the 6,566-yard white markers (the blues stretch the courses a couple of hundred yards further) you will play no less than eight two-shotters over the 400-yard mark. Most of these holes are lined with dabs of gorse and gnarly heather; hit offline and your hopes of reaching the green in regulation have been well and truly dashed. Another trait of Southerness is the deflecting greens, several of which are slightly raised and have the most wonderful natural contours, dips and hollows on the approaches to them. In my opinion the green surrounds, and associated run-offs, could be improved further by cutting back some of the fluffy semi-rough close to the greens. Quite often if your ball feeds down into one of the swales your ball is in the light rough whereas if it was cut tight it would provide more options on how to play your recovery shot. Sadly, its outpost location and therefore lack of proximity to other top class courses means many golfers won’t ever see it - Turnberry is a 2 hour drive away and Silloth, although only 5 miles as the crow flies, will take a similar amount of time. But if you can build this course into a trip, or just fancy a good day out somewhere a bit different and willing to travel, Southerness would be an excellent choice. Just back from playing Southerness. It was a course I had first read about over 40 years ago as being one of the best in the UK, and it certainly lived up to expectation. In terms of location, its not going to win any prizes, being an hour fro Carlisle, but its certainly worth the journey and a 'must play' if you in Cumbria or Dumfries area. The condition of the course for early December was unbelievable...the greens were superb, and general course condition up with the very best I've played (about 500 around the world). The real stand out for me were the wonderfully crafted greens and their surrounds...plenty of little swales and gulleys. Only the perfect line with the approach shot would leave you with a straightforward putt. Plenty of long par 4's and a very strong wind are able defences for this course, and the only thing that didn't add up was the bunkering, especially the one's on the fairway...they didn't come into play. This would be my only minor gripe of what is a great test of golf. As most have mentioned, the 12th is the best hole, and would not be out of place as an Open Championship hole. The drive needs to avoid bunkers on the rights, and the second shot shot needs to be accurate to find a green protected by a mound on the front left. Go left of that and you are in a pond, and overshot the green you're on the beach. Playing directly into the wind, this needs two big hits, and the green has some subtle borrows. A truly great hole. All the par 3's offer a stern test, and are mostly long and well protected. How difficult the course is without the wind I cannot say, but I'll certainly be paying a return visit to find out. Finally, this is a very friendly club, and I was made to feel very welcome, which all added up to a very memorable day. What a magical day at this wonderful golf course. Friendly welcome, good grub and coffee. Neat and tidy course in terrific condition, greens playing really well. Can't wait to re-visit. Played off the whites so the three wood was red hot by the end! Played here on a Monday in late June. Course very busy but the four ball in front got round in good time - 3.5 hours.The setting of this course is as dramatic and beautiful as any I can think of, surrounded by the Galloway hills, the Solway, the Lake District mountains just 10 miles away and, across the sea, the Isle of Man.The course itself is not as linksy in feel as I expected. Not just because of the gorse, heather and willow scrub which threaten a few tee shots, but because there is quite a lot of clover in some of the fairways, and light rough left around some of the greens, which makes the chip and run or putter from off the green a risky shot. I have never hit so many lob wedges from around links greens.The greens themselves were true but very slow when I played, but I'll put that down to its being a Monday. The chipping green was lightning quick.The 12th here with a second shot played into a saddle of dunes hard against the beach is one of the best I've played. Apart from that, I found this a tough, fair and pretty course which is well worth the £50 green fee. A strong four stars from me, but I'd have liked yellow tees that didn't take all the fairway bunkers out of play, and more scope for classic links scrambling. Southerness is the most southerly of Scottish links courses on the west coast. Situated on the Solway Firth, not far north of Silloth, there are lovely views of both the sea and the nearby Galloway Hills. There are no towering dunes but if you miss the fairway the one common feature is the large expanses of thick heather. Pretty much all of the holes are of similar terrain so the opening and closing holes are a good cross section of the rest. The holes all run in a variety of directions. As a result, there is never a feeling of sameness and I have no doubt that if Southerness was located closer to the Open courses, it would certainly be used for qualifying rounds. With five par threes, you might think it is a little on the short side. Surprisingly, it measures 6566 yards, even though the two par fives are just under 500 yards. The length comes from some testing par fours, of which eight of the eleven are over 400 yards. Southerness is not as tough as nearby Silloth but it is still a very good test that is enjoyable for golfers of all standards. Most of the time, you will feel very much alone on the course in this quiet stretch of countryside. This is a very rare and precious commodity in the world of today so don’t miss out on experiencing Southerness. i think the fact that this is ranked No 28 in Scotland perhaps says more about the fantastic quality of golf north of the border than about any failings at Southerness. This place is well worth going off the beaten track from Dumfies for ! played it in May 12 in blustery conditions, while there aren't necessarily many spectacular holes this is a great test of honest Links golf. great bargain green fee, friendly welcome, and excellent condition of course. its perhaps not quite good enough for 5 or 6 stars, but is a very strong 4 star course and perhaps if it was amongst the course south of Glasgow or around Edinburgh it i'm sure would rank more highly. get yourself there, you won't be disappointed. Today was almost five years to the day since I’d last played here and this time, I managed to pick a sunny, almost windless day to enjoy the undoubted charms of Southerness. Fairways were firm and fast – you’d never know we’ve been having heavy rain for months now – and greens were in absolutely top class condition. It was such an absolute pleasure to play a course as well presented as this at this time of year – and in such benign weather conditions too. I’d forgotten that many of the fairways dog leg either one way or the other (they must number about half the holes on the card) and that many of the raised greens are fronted by swales which lie behind forward bunker positions – all very cunning and rather devious! The stretch of four par fours from the 11th to the 14th is nothing short of epic, with the right doglegged 12th one of my favourite holes in all of Scottish golf. I can imagine this course would bare its teeth in a strong wind as the routing changes direction after every hole but today, we were lucky to find it as tame as a purring pussycat. Already one of the best value top ranked courses in the country, Southerness can be played for a remarkably modest winter green fee that should have serious golfers asking why it’s not included in their golfing itinerary between November and March every year. And speaking of asking oneself a question, how on earth did I only give this place a rating of four balls on each of my last two visits?